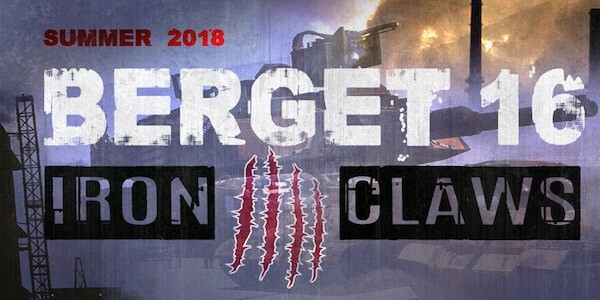 Berget 16 - Iron Claws announced! Berget Events is very excited to present the plans for their upcoming Berget game in June 2018. The story will be a direct follow-up on last years event and many units will return this year. Berget will put a lot of effort into balancing the teams to make sure it will be an equally challenging and action packed experience for all sides. Tickets will run out fast, so please make sure to have a 2nd choice for your team since tickets to some teams/units might run out during the first few hours of ticket release. All tickets to Berget 16 will be released via berget-events.com on Sunday the 5th of November 2017 20:00 CET (GMT+01). The tickets will be sold at discounted price of 129€ (the discount is 30€) the first night. The following ticket prices will increase by the turn of each month. We are doing this to reward those who buy their tickets early which help us plan and make a better Berget for all. Many of our returning players have seen the progress in the digital transformation trend both in Berget and airsoft in general. This Berget game will continue with improvements in communication and technology! Check all their plans and improvements and further details on their website.